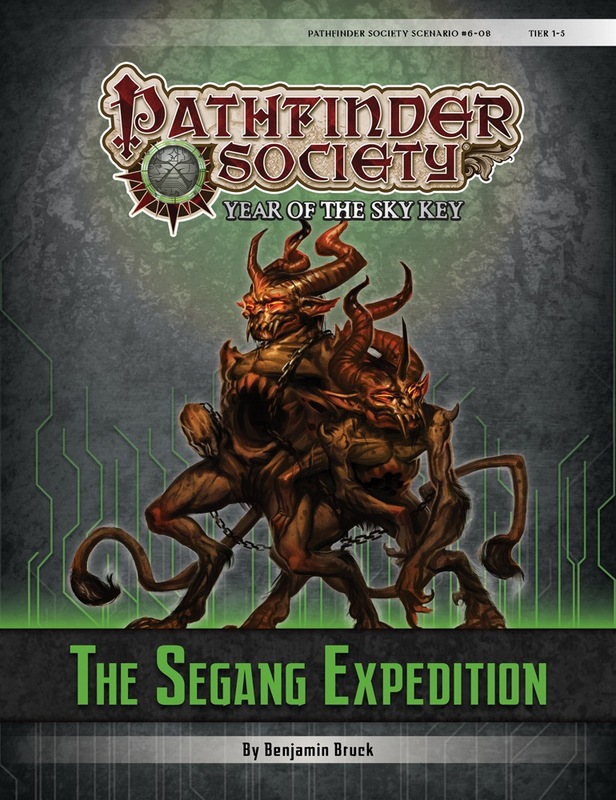 Rumors of a lost shrine in the Segang Jungle draw the Pathfinder Society’s attention, but the prohibitive cost of sending a team into the wilds of Jalmeray threatens to shut down the expedition before it even begins. Fortunately, a wealthy patron has offered to fund the PCs travel expenses in return for their help in his decades-old quest. Can the Pathfinders balance this new obligation with their exploration of the archaeological site? 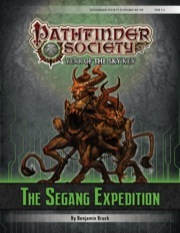 Content in “The Segang Expedition” also contributes directly to the ongoing storyline of the Sovereign Court faction. - Great roleplay. The interaction between the PC's and the expedition members is top notch; the scenario writer provided the GM with great direction to enable roleplay of the expedition members. Not many scenarios do this good a job. Combat was very easy and more designed for atmosphere and immersion than a challenge. Some people may see that as a Con, but for me keeping the combat light and keeping the story moving really helped the players enjoy the scenario and it's noncombat aspects. I ran this for a group of 6 players in low tier. My experience was overall very enjoyable and I absolutely recommend this adventure to anyone who wants to play or run something that supports and encourages roleplay and character interaction. Even the success conditions can only really be met if players put themselves into their characters' shoes and think about what they do and say. There is an easy and rewarding subsystem that encourages roleplay mechanically. If you have very mechanics-focused players, you might even want to tell them about the system to encourage them to get into character. On the other hand, the combat felt a little lacking. It was generally too easy and especially the final battle was underwhelming. I very much appreciated the various ways to avoid combat in most encounters, though. With two fun NPCs, nice enviorment, straightfoward but eyecathching story. One of my favorite, a must play of PFS. Run tier 4-5 once, the last combat can be challenging, but tier 1-2 combats don't scale well in my opinion. At the start of the scenario, I thought this would be a 'babysit this NPC' scenario. I've played similar scenario's in the past and they typically were too focused on the social aspect and involved an incredible amount of talking to that NPC. While I personally don't mind that, it's not something everyone will enjoy, which can influence the mood at the table severely. This scenario however is not like those instances, and in fact offers an adventure that everyone can easily enjoy. Of course you still have to accompany an NPC, but you still have a fair amount of freedom to do other things. Characters that aren't tuned to do well in social situations in terms of diplomacy can still contribute through other ways, be it by scaring wildlife, hunting or gathering herbs and fruits. The social aspects of the scenario also flow over nicely into (potential) fights. The last fight in particular can be considered as hard and particularly challenging, but at the same time is not impossible. The fights make sense and are interesting. It's worth noting this is not your average safari! I was pleasantly surprised by the way the scenario provides options that cater to every character. Regardless of how niche your character may be, you will be able to contribute in a wide variety of ways. Combined with great storytelling by the author, this scenario features fun for everyone and remains enjoyable from the start until the very end. First time back to Jalmeray since #33, I think. That was a fun one. Quick question and excuse my ignorance, but is there some rule or something about only certain star level GMs or venture-staff able to run new games for a certain period of time? Or can anyone run this for PFS once it goes on sale? Usually the exclusives, marked with -EX or something similar--like Day of the Demon, in its exclusive form, are the only one with limits on who can run a scenario. On page 17 it mentions Below Subtier 1-2 rewards. Wtf is that? Did I miss something? That's the encounter with the looters, who just want to bug out of the temple as fast as possible. If the PCs choose not to fight them or talk to them and let them walk out, they'll flee and take all their treasure with them. Rather than lose all the gold from the encounter if the PCs choose not to deal with the looters, the encounter gives the PCs a reduced gold value--the gold from the next lowest subtier. At the 1-2 subtier, they get the gold listed for Below 1-2. Sometimes it pays to be a murderhobo. Less often than it pays not to be a murderhobo. But yes, a little variety keeps things interesting. Where is the faction mission information for this scenario? See the Favor Point sidebar on page 6, and the Faction Notes paragraph on the right side of page 19. A nit-pick: The good baron does not seem to be proficient with his weapon of choice. :) When I played this it didn't matter because he did not get to shoot at his famous 'tiger'. Firearm Style: At 2nd level, a trophy hunter gains the Amateur Gunslinger feat and Exotic Weapon Proficiency (firearms), and can use any 1st-level gunslinger deed (page 10). Started to prep the scenario, and I noticed the Baron fought against the Gorilla King in 2690 AR. This puts him at a little over two millenia old. Am I missing something? Oh. Page 6 Clears that up. 4690 AR when it is mentioned again. even with good aligned weapons Asura fight was a really hard fight with his 4 kukri and 2 claws attacks. 3 of us were with only 3-5 hp and we were really excited when he went down with a lucky critical hit from our prone barbarian!